Following a five-year stint as a marketing executive at People magazine (1989–1994), co-author Amy Cramer founded a fitness-based direct-marketing company, Highpoint Communications, which she sold in 1998. When she and her husband converted to veganism in 2007 to combat Ken’s chronically high cholesterol, Amy retreated to her favorite room in the house—the kitchen—to drum up some tasty recipes. Already an accomplished gourmet chef whose lasagna and meatballs could make Mario Batali weep with joy, she took on the new challenge with gusto and imagination: There would be no cardboard-tasting food in this household. Soon, no one missed her famous paella or steak au poivre, as she conjured up dozens of new recipes that even her meat-eating friends savored—and began requesting. It was just a matter of time before her next entrepreneurial venture was born—the Cleveland-based Dinners Done Now. As owner and head chef, Amy prepared weekly vegan meals for more than 300 clients, among them the Esselstyn family (Rip Esselstyn is author of the vegan bestseller, The Engine 2 Diet; his father, Caldwell B. Esselstyn, Jr., M.D., penned Prevent and Reverse Heart Disease and wrote the forward to The Vegan Cheat Sheet). 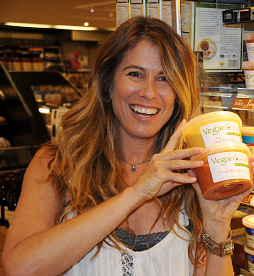 After moving to Boulder, Colorado, in July 2011, she founded Vegan Eats, which produces a line of grab-and‑go vegan meals for supermarket chains—and will soon be available for consumer purchase online. Amy has taught private vegan classes throughout Colorado, Ohio, and in New York City and Westchester County, New York, and has been a guest lecturer at Bronx Community College. Whole Foods Market frequently invites her as a guest instructor. A rising vegan culinary celebrity, Amy is frequently cited in food and health blogs and has been touted in the local press. She lives with her husband and three children—Cai, Liv, and Cam—in Boulder. Contact us at info@veganeatsusa.com for immediate wholesale distribution and institutional sales.